Zambia : How much money has been WASTED or STOLEN now? Home Columns How much money has been WASTED or STOLEN now? How much money has been WASTED or STOLEN now? These planes are RUBBISH! They CRASH and cannot be maintained! Zambia has been conned out of MILLIONS by Lungu signing that deal. Interjet, the Mexican airline, put four of its 22 Sukhoi Superjet 100s out of service and grounded them. Delays in the maintenance of Powerjet SaM146 engines kept the Russian regional jets on the ground. In the meantime, the four aircraft, which were only a few years old, serve as spare part donors for the rest of the fleet. For at least five months, and sometimes much longer, those SSJ100 aircrafts have not flown according to data from Flightglobal. Now the aircraft from the production years 2013 to 2015 apparently go into the decommissioning and are cannibalized for spare parts unavailable from the manufacturing company. The SSJ100 was a cheap deal five years ago compared to same class jets from Embraer, or Bombardier which were as expensive as twice to buy, according to Interjet. Interjet operates the SSJ100s alongside 50 Airbus A320s and six A321s. 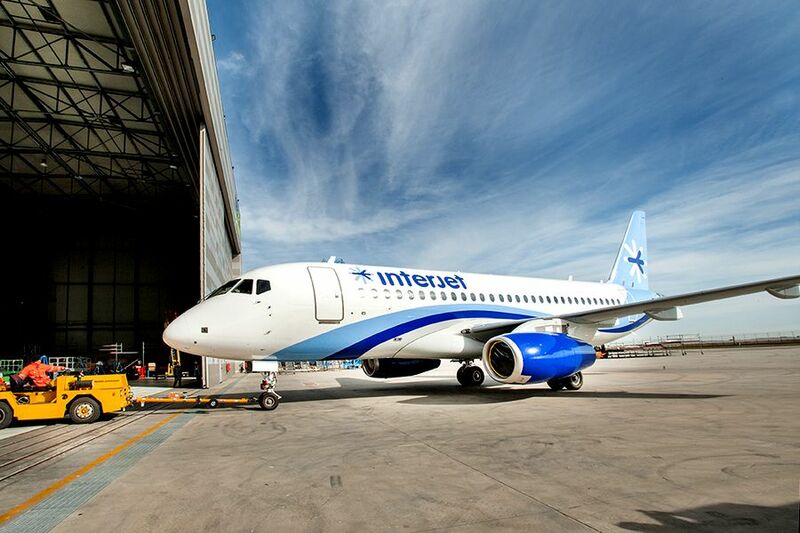 After Aeroflot, which operates 35 SSJ100, Interjet is the second largest operator of the Russian regional jet. Maintenance and spare parts supply were, however, much tougher than expected, admits Interjet CEO Jose Luis Garza. After Russia’s civil aviation authority Rosaviatsia identified early material fatigue on the tailgates of some SSJ100s in December 2016 and advised it to be grounded, many Interjet passengers cancelled their flights with that aircraft. After its establishment in 2005, Interjet rose as a favorable airline in 2011 as the second largest Mexican airline operator behind Aeromexico. In the following years, however, the emergence of Volaris and the strong partnership between Delta and AeroMexico caused Interjet to lose a huge part of its market share. Garza doesn’t want the decommissioning of the four Superjet to be perceived as a symptom of financial difficulty at Interjet. Interjet was looking for investors and partner airlines in the United States in 2017, but there wasn’t any announcement. @wisdom,being a low income country with nothing to show for after 54 years of independence I do not think it’s wise to waste money or let our leaders squander money in the name of giving them a chance. The civil service has lots of professionals who are capable of doing research and advising their respective minister before foolish decisions are made.Would you like to fly in a plane that other countries are getting rid off? Classy article. PF owns jets? The best regional jet is the A321 from Airbus … that’s what the focus should be. The rival is the Boeing 737-800 especially the long version. Great cargo space too but it is a little more expensive than the A321. Also, configuration is very important … an airline can actually increase capacity using configuration and as such be more profitable. I think that the French option is still on table and we have to take advantage of every opportunity. You mean allow them to crush and destroy a few dozen lives first, before you understand why no one else will buy them? “I AM VISION-LESS” proclaimed one candidate. But his worshipers went ahead and sang, danced voted & even rigged for him. This is what you get. Russian Aeroplanes crash on a weekly basis. Their aviation industry is light years behind Boeing, Airbus & Bombadier. Zambia Airways project is being pushed by Findley (Lungu’s drunkard-mate) who wants use it to smuggle drugs & launder money out of the country. It’ll be the tax-payer who will end up paying for the losses ZA will be making just like they did with the defunct ZA. GIVE THEM A CHANCE YOU CHARACTERS………. AIRCRAFT ARE ALWAYS A PROJECT IN PROGRESS..MANUFACTURES ALWAYS LEARN FROM PAST SHORTCOMINGS TO IMPROVE ON THE NEW BRAND. How many crashes and how many dead people does it take to “improve on shortcomings”? These USELESS DANGEROUS aircraft were only bought because someone is getting a kickback. Airbus and Boeing DON’T DO CORRUPT DEALS! Lungu and his PF are the most corrupt Government Zambia has ever seen. Give them a chance as people gave you a chance to have children.If you are to analyse the cost of raising a child,am sure you were not going to have children. Similarly do not talk about something you did not create.The earth was created by God and we can only speculate .What ever happens,we have no control.If a country ‘s wealth or prosperity is judged by the number of university graduates or professors,Nigeria should have been a top country,but look what is happening. Do not be in the forefront condemning what you have no control over.The PF Government is trying every possible avenues to see what can work for the people of Zambia.No risk no gain. @George you have broken my ribs …. By risking people’s lives. I will fly emirates thanks! This is the information which Hinena should have used to argue against buying aircraft for National Airlines as opposition leader rather than talking about building toilets in markets. This is a no brainier, why didn’t they hussle and partner with Kenyan Airways or the Emirates? Give us statics not ranting that these plains are dangerous. We don’t hear of plane clash. Zambians so duly human beings. This story is full of alternative facts. No wonder the author chose to stay anonymous. What a coward. Can he prove that Ethiopian Airline has cheap jets for it’s international flights? Who does he want to cheat? ZA is here to stay, this plane is already on the runway, almost taking off and you can’t put a spoke in it’s wheels. Best thing you can do is clear the runway! This story is from a well respected publication Airliner Watch which reports on airlines around the world. The only “alternative facts” are your wrong facts. And the only “cheats” here are the corrupt politicians that are buying cheap planes that nobody else wants because they are looting the cash for their own pockets. Read the article again. You can find the original article if you just Google AirlinerWatch dot com. Or if that is too difficult for you, go back to school. I am getting really fed up of characters who have become experts at criticising almost everything the PF government is doing. We need people like George who are able to analyse things objectively.Surely we need a national airline, a flag carrier for our country. Who said that Ethiopian Airlines has cheap jets for its international flights? Ethiopian Airlines is one of the best-managed airlines in Africa. Please , while criticism is welcome in a democratic society like ours, let’s ensure that such criticism is objective and based on facts. This pathological hatred for ECL or PF won’t take you anywhere. The Author of the Main article is right. The Government should have done more Professional Consultation, before taking action it has taken. I am a Pilot and Flying Instructor with ardent interest in the promotion of a Private Aviation Industry and viable National Airlines in Zambia. I could have rendered professional inputs and advice. Wasted and stolen money is in Panama! Ignorant Humpty Dumpty tribal party! The author is a Free Manson and a cannibal! He cannibalizes aircraft too! (Read on the photo above)! He did so to Zambia Airways too! UPND are possessed with a spirit of witchcraft and theft-smelling antennas in their noses! Of late all your hate mail is coming at midnight, are you a son of a fwiti? During day time you are quite as a mouse. What is a Free Manson??? STOP spreading lies about the technical aspect of russian Planes. Russian made planes are as advanced as any in the world and it is not true that they are falling out of the skies. Such information is inspired by the CIA and MI5 in order to preserve the market for western made aircrafts. The do not want other manufacturers to have a share of the market. People STOP bring so naive. – One thing I have come to know is that witchcraft in Zambia does not exist. If it were so, ECL could be dead long ago. Hatred doesn’t pay. Same People you hate will never join your party and vote for your Supreme leader. Common sense which is not common for so called intellectuals. Even the fight against cholera was a mistake. PF should have left this fight to the Kanyama residents themselves. Your intervention was not necessary. Let Zambians think for themselves. Everything you do will be judged wrong by Hedious Hyenas.